The Tsitsikamma National Park another prime holiday destination along the South African coastline was established in December 1964. 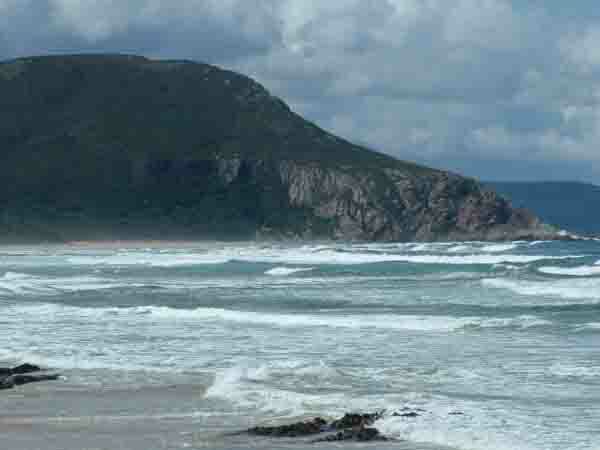 It is an 80 kilometre strip of rocky coastline which starts at Natures Valley in the west and ends at the mouth of the Storms River in the east. 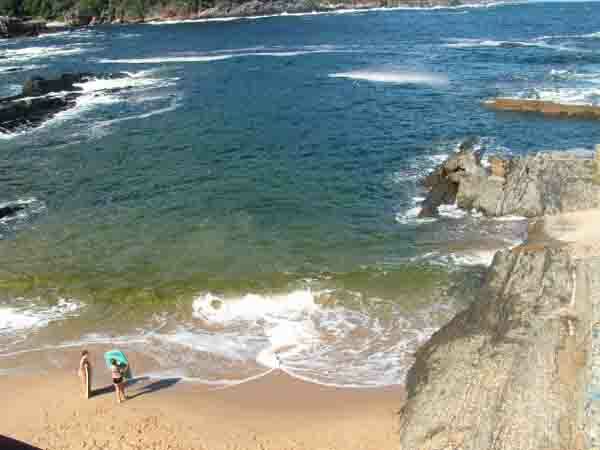 In it is 5400 hectares of indigenous forest and one of the largest marine reserves to be found along the Cape coastline. 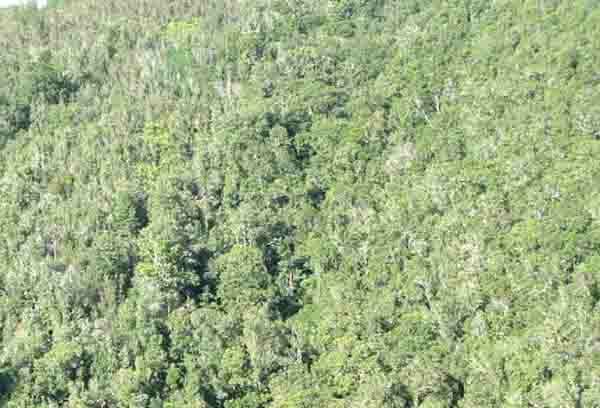 The forests are well preserved and contains some giant Yellowwood trees including one specimen which is 36 metres tall. To get to the park one has to drive about 70 kilometres from Plettenberg bay towards the east through some on the Tsitsikamma Forests that line the N2 highway here. About 20 kilometres from Plettenberg Bay the Tsitsikamma Toll road begins and it has a number of spectacular bridges crossing first the Groot River and then the Bloukrans River before you reach the turnoff to the Park. There is an alternative route for those who want to visit the start of the Otter trail near Nature's Valley. The twisting mountain pass down to Nature's Valley is extremely beautiful with both sides of the road being covered with indigenous forests. It's real “Tarzan” country with large yellowwood trees covered with moss and lichens and plenty of monkey ropes to swing on. Once you get to the bottom of the pass you come across the small village of Natures Valley. The village has plenty of holiday houses and I would imagine a sprinkling of permanent residents. The beach is extremely beautiful with its lovely golden sands with the mountains dropping into the sea on its eastern boundary. At the above signpost is where the 5 day Otter trail begins. This trail is extremely strenuous and is not for the unfit. It runs along the top of rocky cliff faces, into valleys and up the other side, across rivers, rocky paths and beaches. Everything you need has to be carried with you including pots and pans and gas stoves. The overnight huts along the way have to be booked in advance if you should want to walk the trail. The river crossings can be hazardous and one has to arrive at the rivers at low tide to be able to get across them safely. 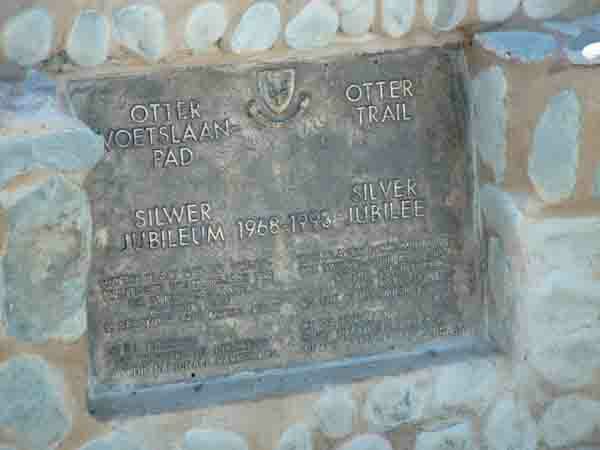 The eastern end of the otter trail is found at the rest camp near the Storms River mouth . Storms River rest camp has a number of facilities including Oceanettes (wooden houses) which are for hire to the general public and a caravan park with sites along the beach. Picnic sites for day visitors are also available. 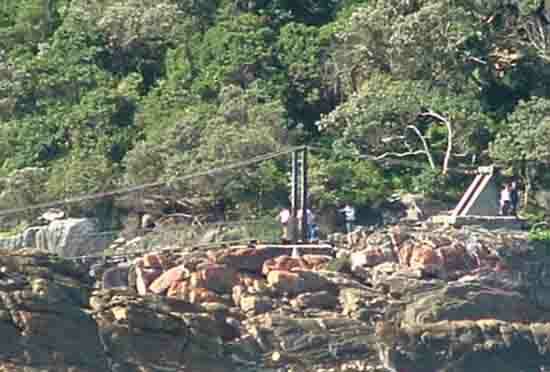 The park has also provided a restaurant near the camp site and this is extremely popular with visitors who stop for drinks or a light meal before taking the short walk (about a kilometre) to the mouth of the Storms River. The path to the mouth runs along the mountain side through the indigenous forests overlooking some sheer drops to the sea below. To increase the safety of visitors and to make the path more accessible for elderly folk (like me) a wooden pathway has been built. In days gone by I remember clambering along the slippery path that used to be there with a child on my back and in some places hanging on for dear life to a tree or plant to stop myself falling. The walk to the mouth is well worth the effort as when you arrive there you come across a very wobbly but safe suspension bridge crossing the river. To get to it you have to negotiate some very steep stairs down to the waters edge. Crossing the bridge can be scary for some especially if someone bounces on it while you are crossing. From the centre of the bridge you get a fantastic view up the river between the sheer cliffs that drop down into the river on both sides. As the whole area is a marine reserve and fish are plentiful one can sometimes see shoals of fish swimming in the water below the bridge. The river is navigable for a short way upstream for small boats and some people do river rafting down the river. It is however not recommended as a number of years ago there was a flash flood and some people lost their lives while river rafting. For those who like to scuba dive there is an underwater trail starting near the restaurant. The Storms River mouth is a lovely place to visit and spend a couple of days. There are a number of shorter trails that one can walk during your stay. The best part is that one can lie and tan, on the small beach near the restaurant, swim out to the raft that is sometimes anchored in the bay and generally have a really relaxing holiday far away from the city lights. For campers the camp authorities provide lectures and videos on nature during the evenings. It's a good place to stay so why not book your holiday today.